I knew this performance would be #1 on this list the minute it aired, way back in the third episode of ‘Glee’s second season. Nothing else ever really stood a chance. For me, the relationship between Kurt and his father has always been the highlight of the show. Mike O’Malley surfaces only a few times each season but he always brings compassion and realism to the role of Burt, a blue-collar single father of a gay son. My first ‘Glee’ countdown featured four solos or duets by Lea Michele. This marks just the second from Season Two. I don’t know if her character, Rachel, was given less to do this season or if others just stepped up more, but I was surprised when compiling candidates for this list to see how seldom her name came up. At times Darren Criss threatened to completely take over Season Two of ‘Glee.’ The show was already suffering from too little Kurt with him leaving New Directions, and when we followed him to the Dalton Academy, it wasn’t him but Blaine who got all the solos. 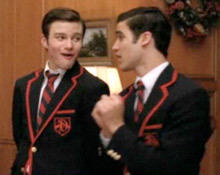 We got Blaine and The Pips, as Kurt put it. I can understand the show runners’ desire to put Blaine front and center. He’s a dynamic performer, charismatic as hell and catnip to girls and boys alike. But he was also a guest star on a show with too many stars to feature already. ‘Glee’ is packed with hot chicks but for my money the hottest of them all is Santana Lopez, played by Naya Rivera. What, you expected Lauren Zizes? In Season One, Santana wasn’t given much to do other than look good, deliver sarcastic insults and occasionally make out with Brittany. But this season, she realized that those sessions with Brittany were more than just playful experimentation. The character has given show creator Ryan Murphy another avenue to explore the experience of coming out in high school. 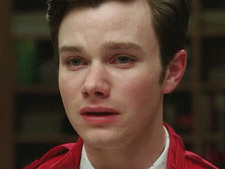 One of the best and worst things to happen to ‘Glee’ in Season Two was the emergence of a love interest for Kurt. On the plus side, the bullying storyline that drove Kurt from McKinley High to the Dalton Academy was well handled and poignant. And Blaine Anderson (played by the super talented Darren Criss) proved a dreamy distraction from the troubles Kurt left behind. The blooming of their relationship was a joy to watch, and how great to imagine all the American households rooting for a couple of gay kids to have their first kiss. When Mr. Schuester announced that the glee club would be writing and performing its own songs for the regional competition, I groaned. I love the way ‘Glee’ re-imagines existing songs — their biggest successes are almost always tunes I recognize instantly. Wouldn’t original songs, simply by virtue of being new, lack that ability to grab me at first listen? And would whatever songwriters the producers hired to pen these songs really be a match for the tunesmiths ‘Glee’ usually covers? Most great ‘Glee’ performances start off as great songs, with the cast putting its unique twist on some old classic or new hit. 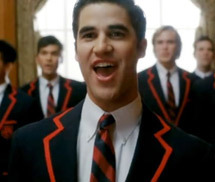 But sometimes even a crappy song can turn into a great ‘Glee’ moment. A performance of Rebecca Black’s ‘Friday’ in the prom episode comes to mind… somehow they turned that joke of a song into an ironic, infectious party anthem.